FANS of The Bluehouse knew the day was coming. After a final round of gigs this month, the trio will bid farewell to founding member Samantha Harley. Harley has performed with the folk trio for the past 12 years. and has enjoyed national and international touring success. The Bluehouse has been at the fore of female-led music groups in Australia for the past 10 years, releasing three independently produced albums. 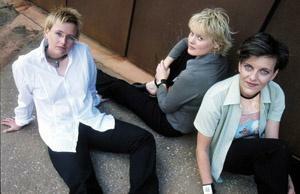 The trio was formed in the mid- '90s by Harley and fellow Melbourne girls Jacqui Walter and Bernadette Carroll . It developed its own style quickly by blending folk, pop and contemporary acoustic music. As a constant touring unit, The Bluehouse has become a firm favourite at festivals including the Philadelphia Folk Festival, California Worldfest, Woodford Folk Festival and Edinburgh Fringe Festival. The t will be the last chance for Newcastle fans to see Harley performing alongside Walter and Carroll when th trio will appear at the Gateway Hotel , at Islington, tomorrow night. Walter said they had been rehearsing lots of old songs so they could cope with any requests. Harley will play her final show with the group in Melbourne at the end of the month. Tickets are on sale at the Gateway Hotel or online at bigtix.com.au.